Quality dishes start with quality ingredients, and when it comes to meat you’ll be hard-pressed to find any better than Peter Hannan’s award-winning produce. Fiona Beckett reports. Hatted and dwarfed by our unflattering white coats, we walk into Peter Hannan’s salt ageing room. Surrounding us is more beef than you could imagine, garnet-red flesh, dark with ageing, marbled with creamy fat. Most of it is around 45 days old, but some is even older. ‘This,’ says Hannan, handling a weathered rib of beef, ‘has been in here since April 1 last year [16 months at the time of writing].’ By rights the room ought to reek, but it’s clean and sweet-smelling. In a period when the butchery trade is in decline, Hannan is able to sell every piece of meat that comes his way to a clientele that includes most of Belfast’s best restaurants and several of London’s – including swanky food emporium Fortnum & Mason. Not to mention his own outlet in Moira, where he sells his award-winning meat to the public at the same price he sells it to restaurants. ‘Why on earth should I discriminate against people who pay cash and pick up the meat themselves, rather than traders who need me to deliver and expect a month’s credit?’ he asks with irrefutable logic. How on earth does the meat keep that long, though? Interestingly, it’s not just about the salt, but also light, temperature and air speed. Hannan is not, of course, giving away any trade secrets, but explains how the process works. ‘The first 12-14 days is all about bringing the temperature down gradually, letting the bacteria break down the muscle, displace moisture and concentrate the flavour. What we’re looking for is an intense taste of beef – we don’t want it to be cheesy or gamey,’ he says. How on earth did he find all of this out? Does he have a scientific background? ‘No, just an inquisitive mind,’ he laughs, heartily. ‘When we started experimenting we looked into various ways of inhibiting bacteria – some don’t grow in darkness, so we introduced UV light – but there was one group we just couldn’t get rid of. ‘We asked this American university I’d tracked down on the internet [which he won’t name as it wasn’t part of their official research] and they said “have you tried salt?”. We tried putting it on the floor, but it didn’t make an iota of difference. We tried rubbing salt into the meat, but we found that started to cure it; then we changed the salt. Doesn’t it dissolve, though? ‘They told us it would last three years at best, but so far it’s lasted six. We’ve only changed 11 out of the 1,200 original blocks,’ says Hannan with quiet satisfaction. ‘There are a lot of people claiming to have a salt chamber, but it’s not the real thing. I’ve had people ring me up having spent a fortune on Himalayan salt and it’s dissolved in six weeks. The surprise is that, when the meat is cut (a fine 3mm is sliced off before it’s sold), it temporarily restores its normal, vivid red colour. The taste, though, is not salty; definitely deeper, beefier and more concentrated. It reminds me of a mature red wine such as a Bordeaux – maybe even the complexity of an old Highland malt. Hannan doesn’t have cattle of his own, but has a stake in Glenarm Shorthorn and takes its entire production. ‘Every loin and rib comes into this chamber, but it still only accounts for 10% of what we produce,’ he says. ‘We age 1,000 loins and ribs a week, but Glenarm produces the best.’ Unsurprisingly, I find he has a major input in the way the cattle are reared and slaughtered. ‘We hand-select each piece,’ he says proudly. I bet he does. 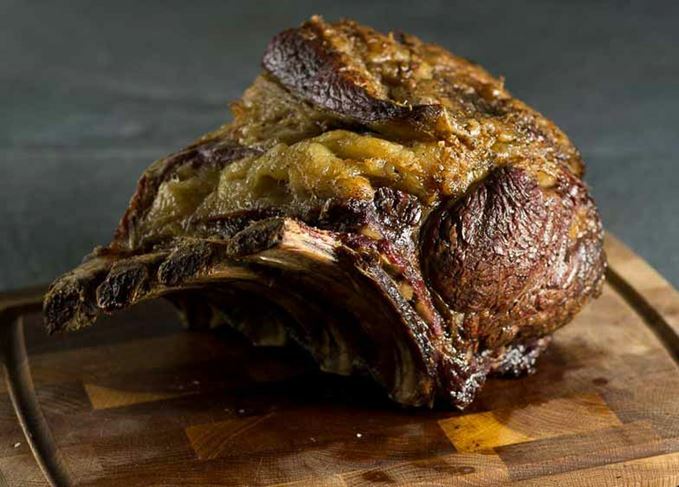 In the ultimate accolade for a butcher, his four-rib roast has just won a gold medal, Ireland’s Golden Fork and the nomination of ‘supreme champion’ in the Guild of Fine Food Awards, something an unprocessed product has never achieved before. He’s currently building two more salt chambers to keep up with demand. But surely he’ll run out of beef? Would he consider sourcing some from south of the border? He looks at me penetratingly: ‘Could be, could be,’ he says airily. Peter Hannan’s salt-aged Glenarm beef can be purchased from Fortnum & Mason or, if you’re lucky enough to be in Northern Ireland, direct from his Moira shop, The Meat Merchant. Raw beef is seasoned with olive oil and lemon. Caol Ila, with its oily texture and hint of bitter black olive, will complement this refreshing starter and respect the delicate flavour of raw meat. It can also work with an unpeated, Bourbon cask-matured citrussy malt. This dish requires a characterful and spicy whisky. The obvious pepperiness of Talisker (the Storm version has this ‘straight in your face’ profile which will be gently soothed by the cream sauce) makes it a perfect matching. The smoky notes of the whisky linger in the back. The beef has a mouth-melting texture, the sweet and spicy sauce is enhanced by a dry, spicy whisky with a delicate oaky frame. You will find plenty of candidates among Speyside malts: Glendronach 15 Year Old Revival, Glenfarclas 17 Year Old, Aberlour Double Cask Matured, Glenrothes 1988... The more matured the beef is, the older the whisky should be. A rich and elegant combination (not cheap, obviously!). The Fife distillery has released the first in a new series marking Scotland’s patron saint.